A Muslim US Army chaplain who worked with al-Qaeda suspects in Guantanamo Bay has been detained by military investigators, US officials say. He has not been charged, but it is believed that he is suspected of espionage. 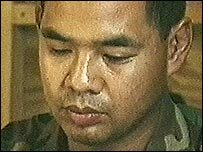 Captain Yousef Yee, formerly known as James Lee, has been held since 10 September as part of a military investigation, said Captain Tom Crosson, spokesman for Southern Command, which oversees the US base in Guantanamo Bay, Cuba. The chaplain was arrested on his arrival at Jacksonville Naval Air Station in Florida after customs officials became suspicious of documents found in his baggage and called in military authorities, law enforcement officials said. Reports say these documents included maps detailing the location of various prisoners within the Camp Delta detention centre in Guantanamo Bay and the names of their interrogators. Agents from the Federal Bureau of Investigation are said to have assisted in the arrest itself and sat in on interviews conducted by military investigators in Jacksonville, the New York Times reported. An apartment in Miami, Florida apparently used by Mr Yee was also searched by FBI officials, the paper said. Mr Yee is currently being held at a US naval detention centre in Charleston, South Carolina. A Chinese-American born in New Jersey, Mr Yee who graduated from West Point military academy and converted to Islam more than 10 years ago while serving in Saudi Arabia following the first Gulf war, the Washington Post newspaper reported. He then left the US Army and lived for four years in Syria, where he learned Arabic and Islamic practice, before rejoining the army and being appointed last November to work with the Guantanamo prisoners. "He had daily access to the detainees," Captain Crosson told the Associated Press news agency. He also advised the base commanders on Muslim affairs, Captain Crosson said. In an interview with the BBC earlier this year, Mr Yee said that he was sent to Guantanamo Bay to help those being held at the base. "I like to think that whatever I can do, whether in their personal situation or help with them being here in any way, that I have a positive effect on their life," he said. Ibrahim Hooper, a spokesman for the Council on American-Islamic Relations, told the New York Times he was concerned Mr Yee's arrest would provoke ill-feeling. "There are those in our society who love to question the patriotism of American Islamics and this unfortunately will give them ammunition to do that, no matter what the facts of the case are," he said. Around 660 al-Qaeda suspects and alleged members of Afghanistan's former Taleban regime are currently being detained at Camp Delta. 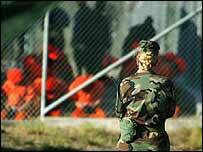 Designated "enemy combatants" by the US Government, none have so far been charged with any crime. "Captain Yousef Yee wears the stars and stripes on his sleeve and the Islamic crescent on his cap"